Why did my laser projector fail? Why is my laser projector less bright? Why are my laser projector’s colors different? If you have asked yourself questions like these, don’t feel bad – You are not alone! Every day people around the world experience this very same issue, and have the unpleasant experience of having to deal with a broken or unusable laser show projector, that is the result of premature laser diode failure. And premature laser diode failure is caused in many cases, by electro-static discharge (ESD) and power surges. Thankfully, there is a solution, and it’s called LASORB! Nearly all laser show projectors, have laser modules inside. And inside most laser modules, are laser diodes. A laser diode is a small semiconductor device that produces coherent radiation. 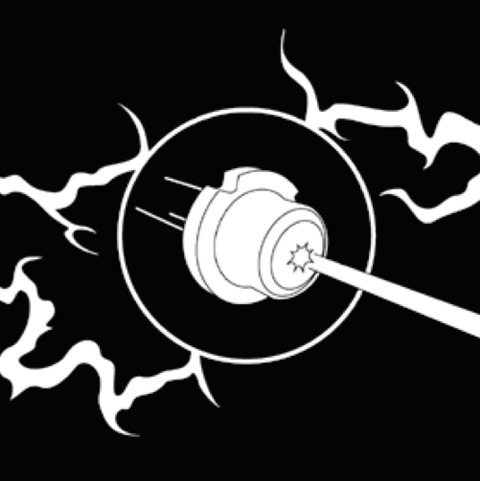 A diagram is shown below, illustrating what a standard professional laser show projector looks like. The picture next to this, shows you inside of the laser projector, so you can see what a typical laser module looks like. And next to that, you see inside the laser module, where the sensitive laser diodes live. Laser diodes are very fast devices that react rapidly to changing voltage and current. And scientific evidence suggests that many laser diodes fail long before their life expectancy, in many cases, because of ESD and power surges that are generated during power on/off cycles. Voltage spikes are often produced at these times, and their cumulative effect on laser diodes is highly detrimental. 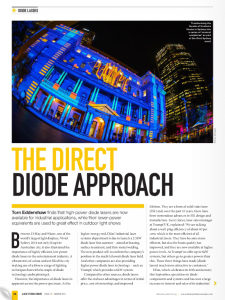 Even a small ESD event or power surge, can substantially harm a laser diode to the point where it is noticeably less powerful, or in a worse case scenario, entirely unusable. So if you have ever wondered “Why did my laser projector fail?, Why is my laser projector less bright? or Why are my laser projector’s colors different? 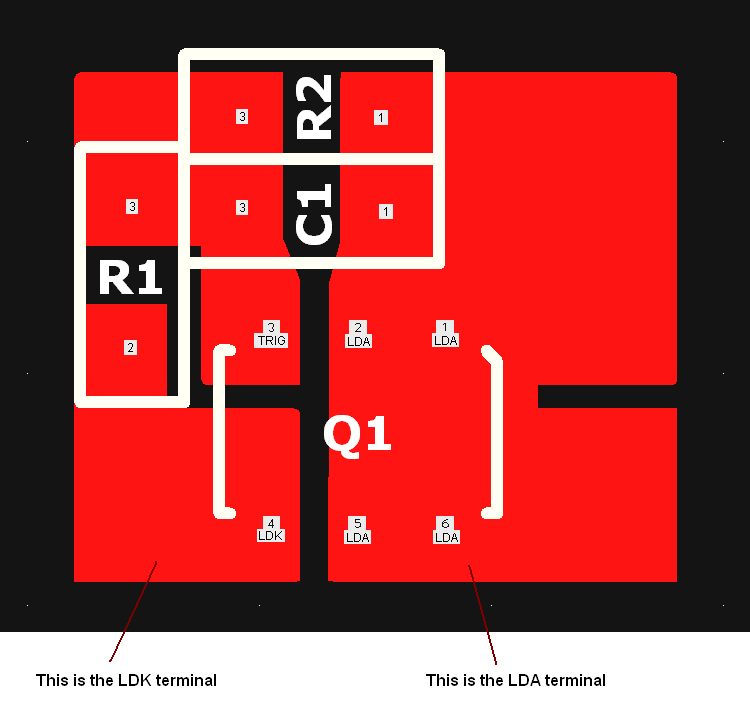 … Chances are, an ESD related event or power surge, was the culprit. Based on our extensive testing and evaluation, we developed and patented a new method of protecting laser diodes — a hybrid component called LASORB, that keeps ESD and power surge spikes from exceeding the diode’s normal operating voltage. LASORB also absorbs high energy in the circuit until ESD and power surges subside, as current is shunted away from the diode. Thus, protecting your sensitive laser diodes, and ultimately, your valuable laser show projector. LASORB’s primary means of protection is a slew-rate detector that monitors the voltage across the pins of the laser diode. If there is a fast change-of-voltage condition detected, this triggers LASORB to aggressively conduct the voltage (and thus current) away from the laser diode. The conduction is initiated very rapidly – in some cases less than one nanosecond. The conduction can last from several microseconds, to tens of microseconds. Next time you go to purchase a laser show projector, make sure to ask the manufacturer if LASORB is installed, on the laser diodes used within the unit. This is a sure-fire way, to get an idea of the quality of the system. LASORB is very inexpensive, and can cost as little as $2 for manufacturers to integrate. So if your provider is not using LASORB, ask them why! 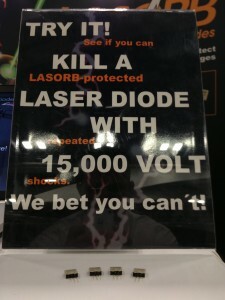 Think of it as an insurance policy for your laser projector, which will protect it from ESD and power surges. You can also integrate LASORB into your existing system, or you can browse Pangolin’s line of professional laser projectors, all of which feature the LASORB component, on each and every singe laser diode used. You can see our complete lineup of systems, at http://www.getalaser.com. Below you can watch a live video (shot with an iPhone, and not fancy editing) that shows LASORB in action, protecting the popular 520nm GREEN laser diodes, so commonly used across the laser show industry. This entry was posted in News and tagged cittadini laser, KVANT laser, laser projector, laser show, laser show projector, laser show projectors, Laserworld Laser, Pangolin Laser, Pangolin Laser Shows, show laser, show laser system on 01/28/2016 by bob.pangolin.com. We’re very excited to announce that our LASORB division will once again be exhibiting at the 2015 Photonics West Show in San Francisco California, from February 10-12th. We’ll be showcasing our award-winning lineup of LASORB components, which were the first – and still the only guaranteed solution to protect a laser diode from damage caused by ESD and power surges. Stop by our booth for a live demonstration, or to get some LASORB samples to test for yourself. We’re located in the South Hall of the Moscone Center, in Booth #2208. Get your FREE PASS to this year’s show, Click Here! This entry was posted in News on 01/17/2015 by Justin Perry. We are very excited to announce, that we are now offering our patented, award-winning LASORB component, in an SMT form. LASORB is a hybrid electronic device, which consists of passive electrical and active silicon components, that come together to help protect laser diodes from electrostatic discharge (ESD) and power surges. 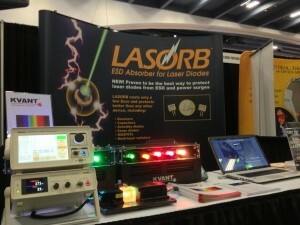 Currently LASORB is the only proven device that can guarantee the protection of laser diodes from ESD and power surges. 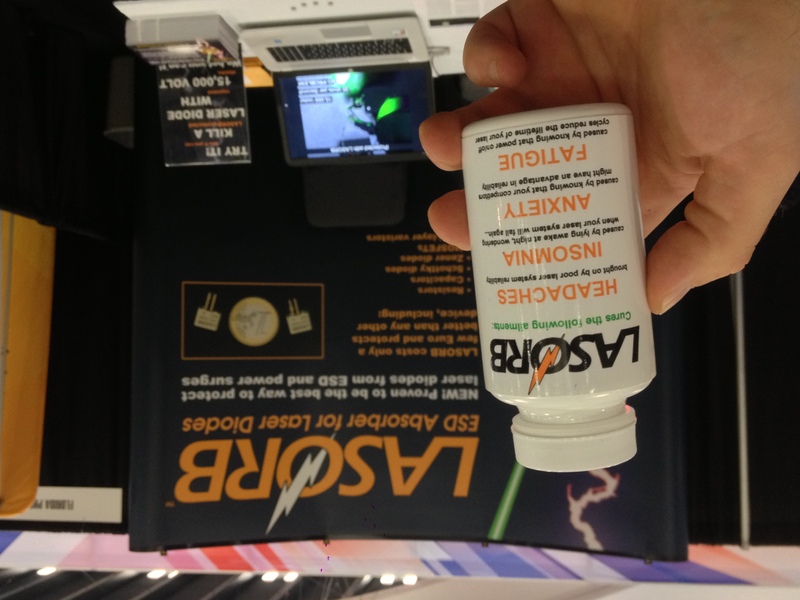 LASORB has been on the market since 2008, and is currently utilized by hundreds of well-known companies, to protect the laser diodes inside of their various product designs. LASORB has historically been sold in an encapsulated “through-hole” component form. However, in working with many clients across such a broad spectrum of laser applications, it became clear to us, that by offering the product in an SMT form, it would help accommodate clients who need a smaller overall package, or who need to employ entirely SMT-based assembly techniques. The LASORB SMT KIT consists of two resistors, a capacitor, and Pangolin’s TSOP6/4G-20V LASORB semiconductor. In addition to providing clients with a smaller package size, the LASORB SMT KIT also offers substantial cost advantages, as it is at least twenty percent less expensive to produce when compared to the traditional through-hole component form. 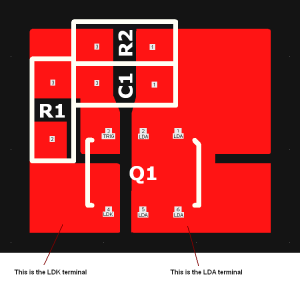 To help clients understand how the individual components within the kit should be connected together, and connected to a laser diode, we have published the circuit layout of the LASORB through-hole part. The circuit layout clearly identifies all components in the LASORB SMT KIT including all resistors (R1, R2), capacitors (C1) and the TSOP6/4G-20V semiconductor. We have already begun selling the LASORB SMT KIT to clients, and stock is available on all LASORB components in our USA, EU, and Asia offices. We are also offering a program, whereby you can obtain samples of LASORB, by sending in a request via our website and discussing your product application with us. 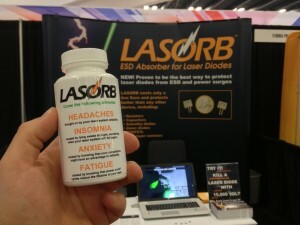 More information about this is available at http://www.LASORB.com. This entry was posted in News and tagged ESD protection, laser diode, laser diode protection, OSRAM on 05/16/2014 by Justin Perry. 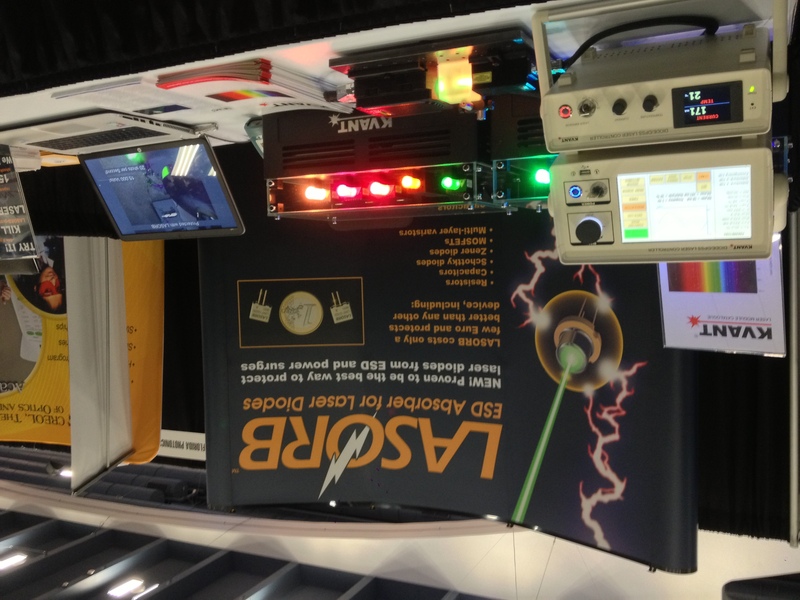 We’ve just returned from the 2014 Photonics West Exhibition in San Francisco, where we showcased the latest developments coming from our LASORB product line, including new LASORB components optimized to protect GREEN laser diodes, like those made by the company OSRAM. We also compiled a short video from the show, which discusses LASORB, and explains how the product works and the advantages it can give you as both a consumer or manufacturer of laser equipment. If you have any questions on LASORB, or would like additional information, email us (contact@lasorb.com), we are happy to help! 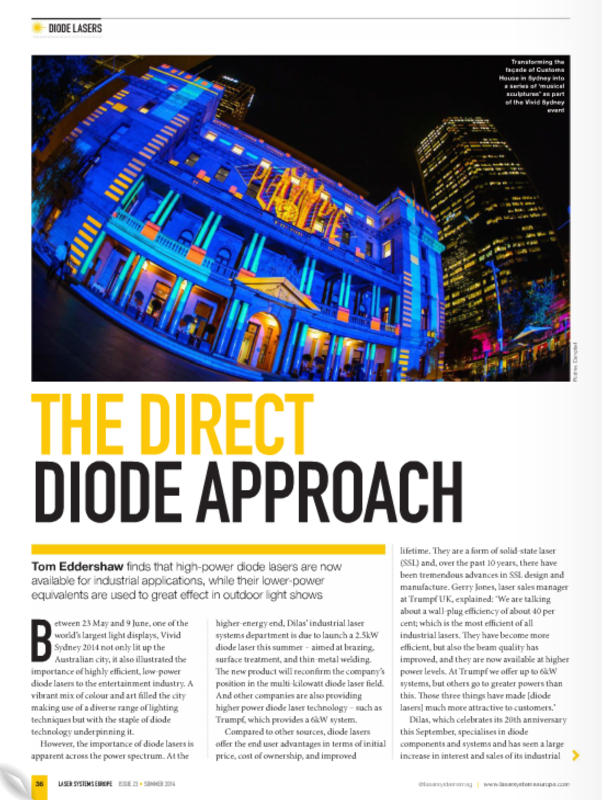 This entry was posted in News and tagged diode, laser, laser diodes, laser entertainment, Laser Projectors, laser show, LASORB, Nichia, OPTNEXT, OSRAM on 02/12/2014 by Justin Perry. 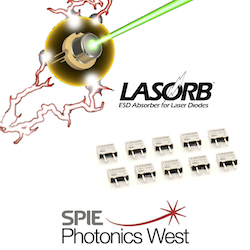 LASORB, the ESD absorber for laser diodes is proud to be exhibiting at the 2014 Photonics West show. This year, we are very excited to showcase a few new LASORB components, like our L44-916 and L44-392 devices, which are specifically optimized to protect popular laser didoes like the OSRAM GREEN laser diode, and OPTNEXT RED laser diode. In addition, we are showcasing LASORB devices for a variety of other laser diodes, such as red, green, blue, infrared, and Quantum Cascade Lasers. 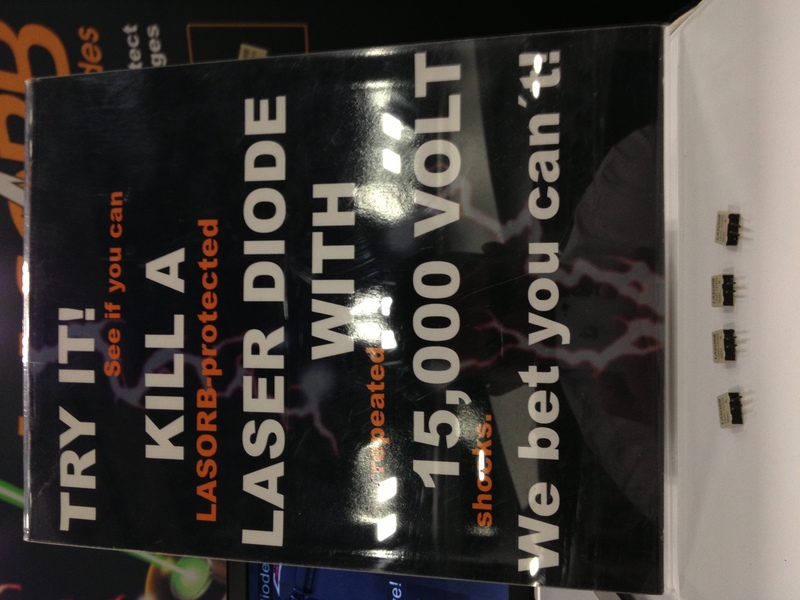 Stop by our booth (2104, south hall) and learn more about why LASORB is the world’s leading protection device again ESD and power surges for laser diodes. This entry was posted in News on 02/05/2014 by Justin Perry.